Excelent work. Shes looking great. The rigging through the channels is also called back stays. Back stays pull the mast back and fore stays pull it forward. Its facinating to me how much of the masts strength is not so much in the masts but in the rigging. 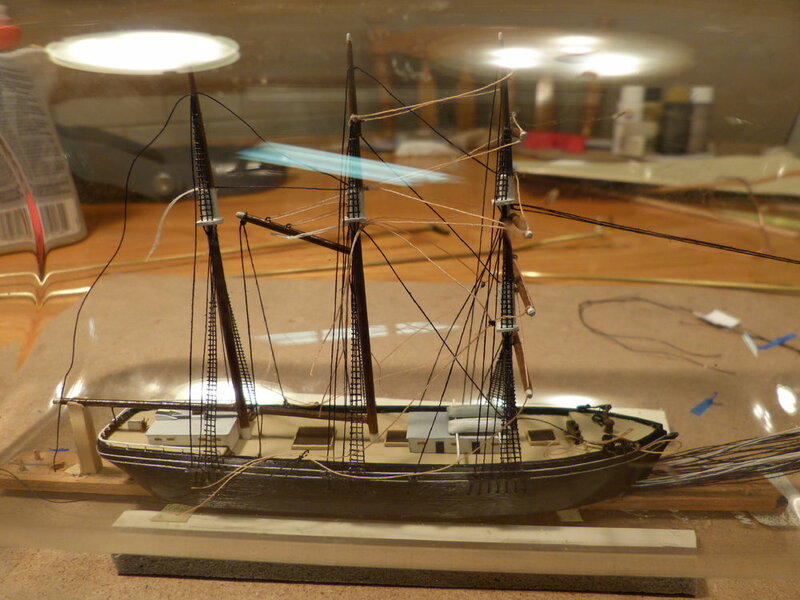 You have probably already seen as you got the shrouds in, how much more sturdy the mast feels even though its hinged. I hope I dont come off picky mentioning the names of parts. I don't expect every one to know all the parts. Its just helped me in my own research and communication. If I'm being to picky just tell me to simmer down. You aren't out of line, Mr. S. and what you are sharing could benefit all who visit here. I've spent some time in research with this project and have a few files saved of basic sailing ship information and diagrams. Of course, rigging nomenclature is covered in class 101 and I should take the time to start using it! 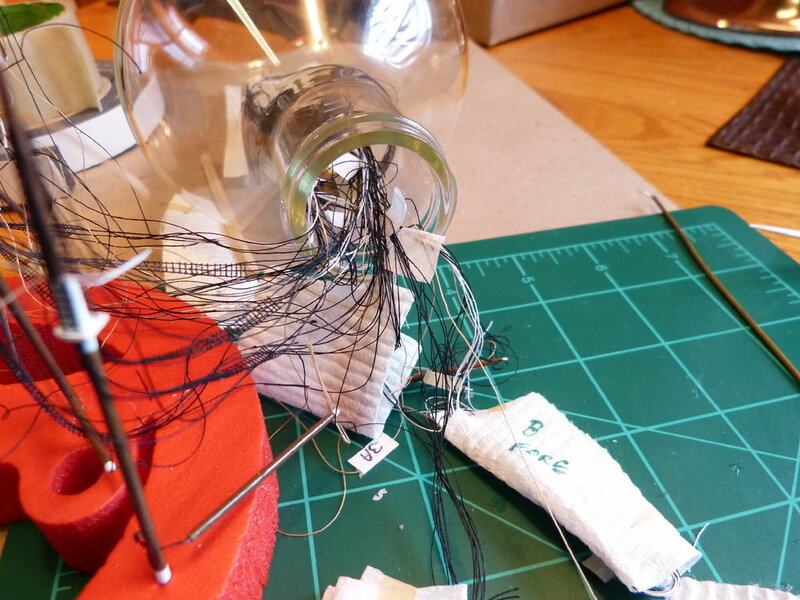 When it comes time for the final adjustments in the bottle, I'm anticipating quite a bit of "back and forth" with tensioning the lines to keep things square and to avoid slack. 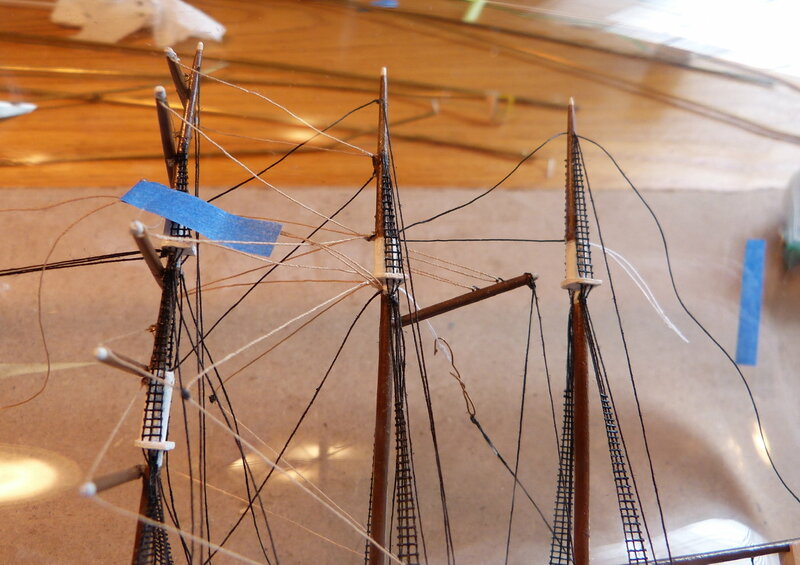 I don't think an adhesive will be necessary between the masts and the hull, in this case. 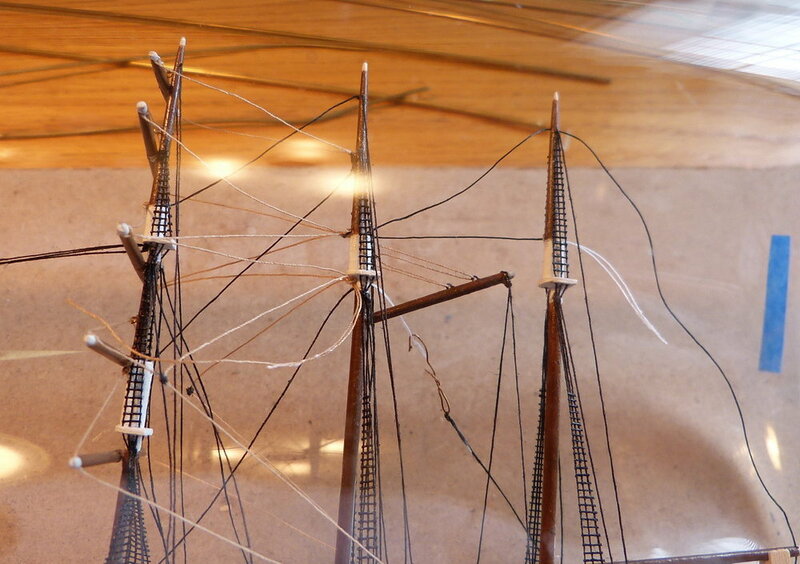 I agree the rigging will keep the masts in place. 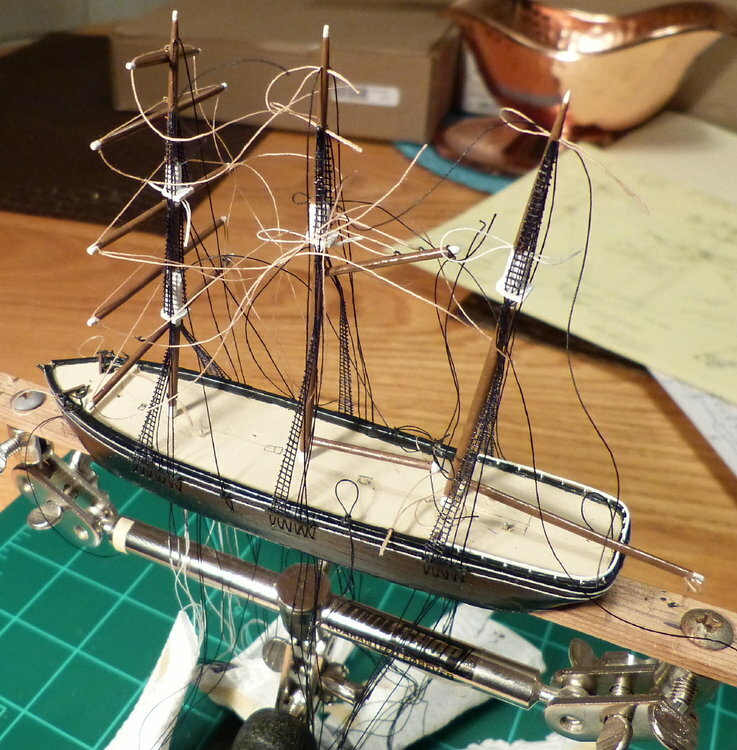 It will be a bit tricky with the line tension but with one mast going in at a time I think you'll have plenty of room to maneuver. It's a solid plan, I think it will work out great. FWIW, I never used any adhesive to hold lines. 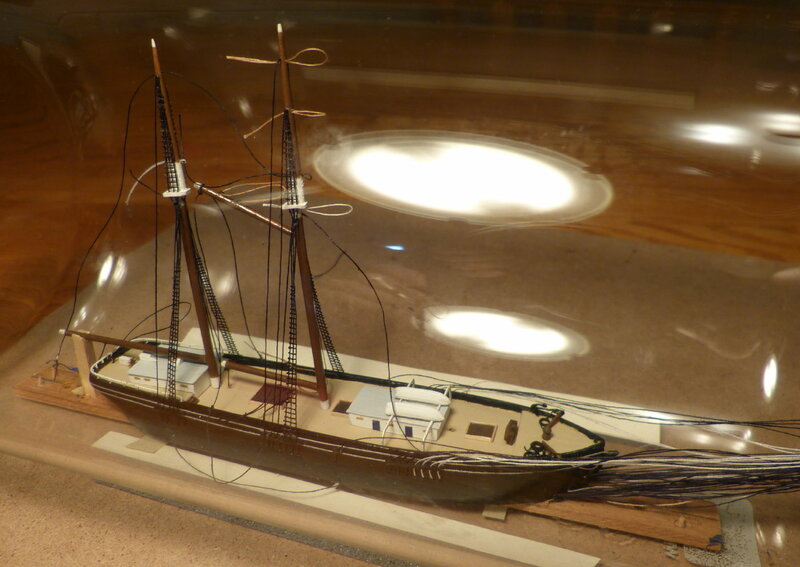 The lines had plenty of 'friction' within the hull, masts and yards and all loose ends are buried in clay. 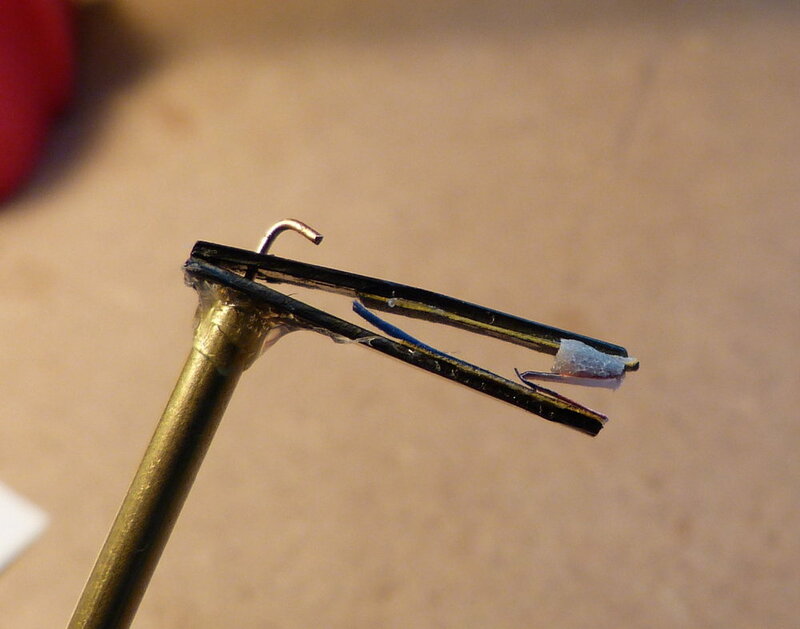 The use of adhesives to hold lines isn't a bad idea and there may be instances where it is advantageous but for ALL lines it seems to be an extra step that isn't needed. 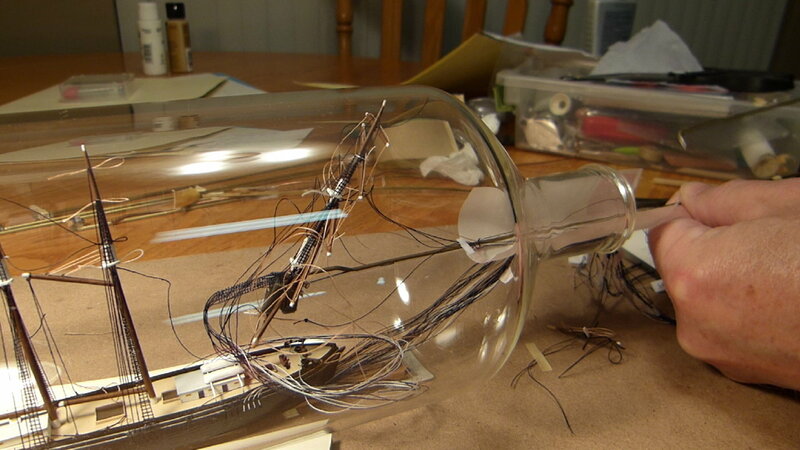 I like to drag one mast into the bottle at a time (I've never built a 'folded' SIB). It just gets crazy sometimes with lines hanging out of the bottle so patience is key. I'm sure I'm preaching to the choir! I appreciate the voices of experience especially at this point because it's very close to bottle time. I'm organizing the threads by tagging them and noting what's what. 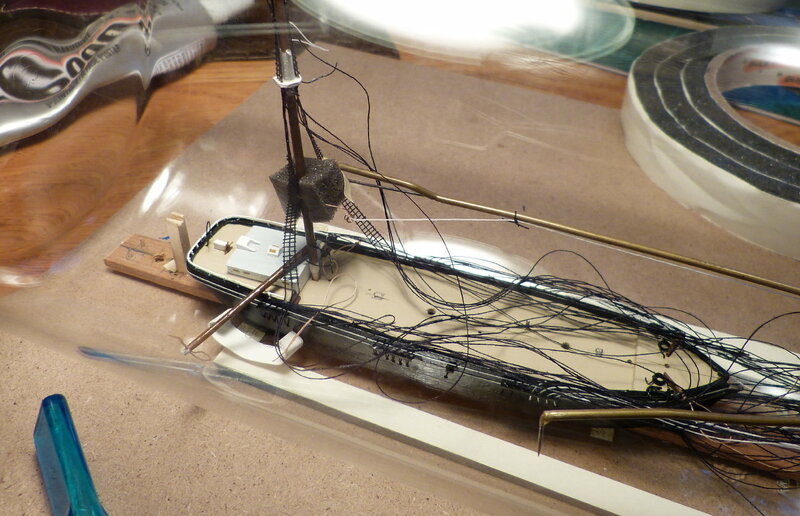 Now I need to make sure as best as I can that the lines under the hull will not bind against each other. I'll post an underneath view of the hull at some point. If things under the deck go south, I've got Plan B which is to control the lines at the channels. 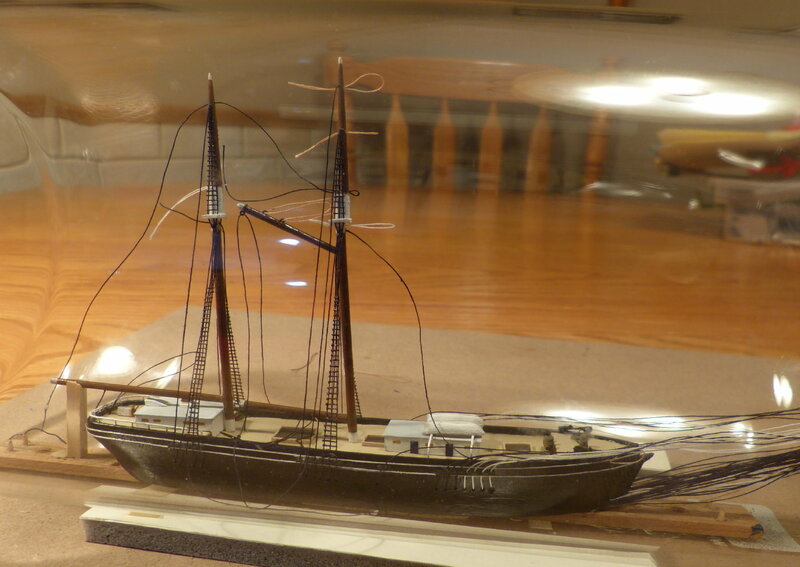 When the hull is in the bottle and the masts await outside of it, the number of lines going through neck will be doubled compared to when the masts are in the deck. Yes, patience will be mandatory! Here's the port side of the foremast backstays that I installed this evening. Split the hull. Took some force as I anticipated because of the adhesiveness of the deck paint at the seam. It's crazy, ain't it? Do you have Bill Lucas' book? I use his method for the task. No, ARUP, I've never read his book. What is the comparison? I saw your earlier mention of bringing the masts in singly. I'm doing mine that way for sake of appearance; no hinge. Just got the first mast in and the "super tool" did the job! After removing the tool, I had to lift the mast out of the hole only once to move a line around. You are putting your ship in the bottle pretty much the way he describes except that he developed a 'deck plan' as a control board. All the lines from the 'upper works' pass through the hull and end at the control board. Of course, the lines are plenty long to allow for them to double back on themselves, as you show in your build. 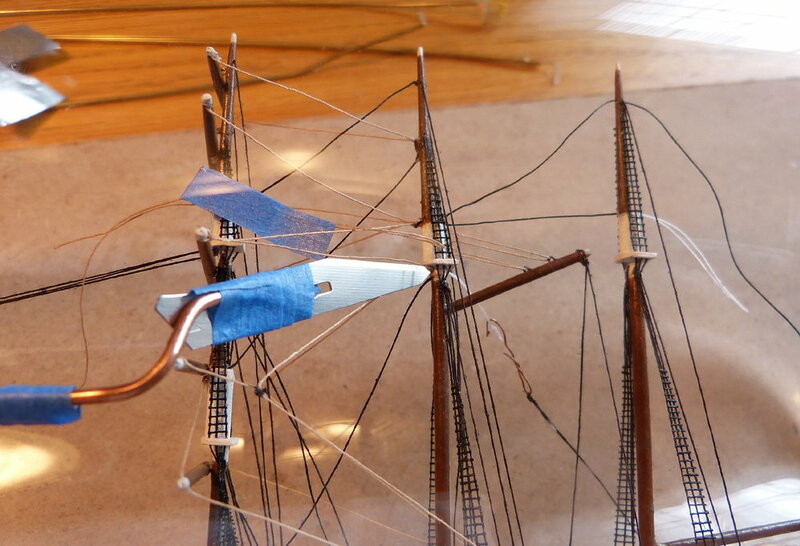 Then, you pull the masts up off the hull and put them into a temporary 'holder' to help contain the rigging 'madness'! What's nice about the control board is that it is just that! Each lines passes through a hole in the board that corresponds to what rigging passes through the hull. 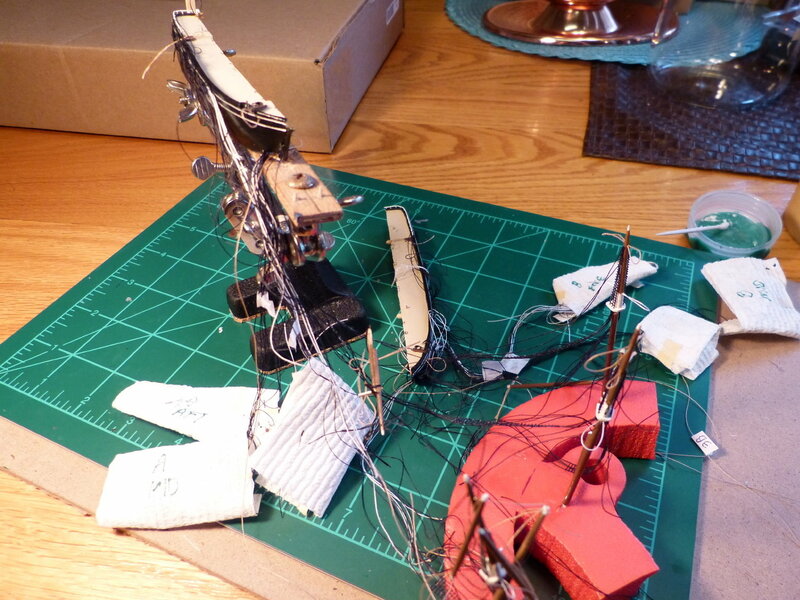 It is difficult to get any lines tangled or crossed! 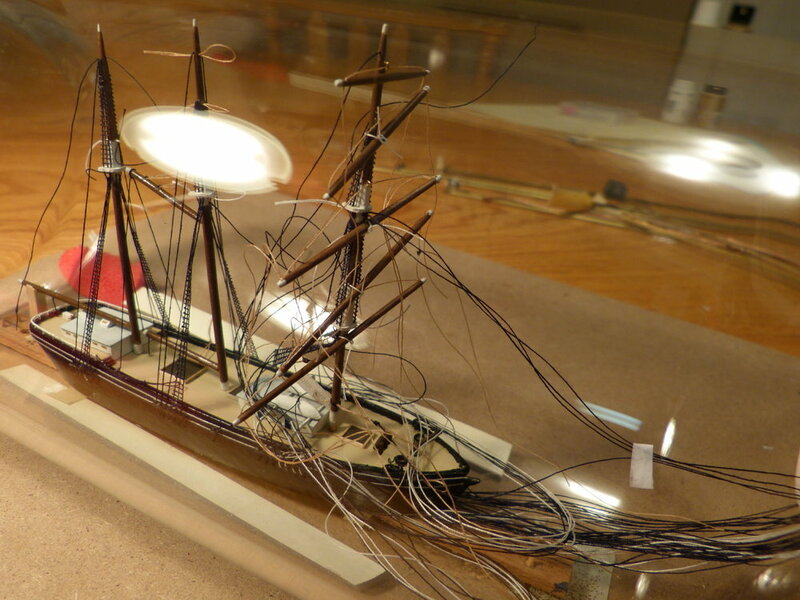 With my Elissa (which got stolen off the museum ship in Galveston, TX), I think there were ~120 strings to the control board. I like the split hull method, too! I like to put the 'water' in first. I'm really looking forward to more posts! Thanks! I think I follow your description. If you had 120 lines to contend with, I'd say whatever method you used must have worked. I'm dealing with about 40 lines. Maybe we'll see a pic or two of your Elissa. Shame about what happened to her. I appreciate the comments! All of the deck elements are installed. Touched up the hull seam with paint and it turned out beautifully. Started above deck line threading and doing what I can there before the foremast goes in because the yards on it will hinder rearward access. Those stays are nice and tight. She's coming together nicely. Image captures of video of the foremast installation. That looks like it has been fun going in the bottle so far! Thanks for posting. Progression of trimming the excess of two yard braces. Third photo is of right after the cut. 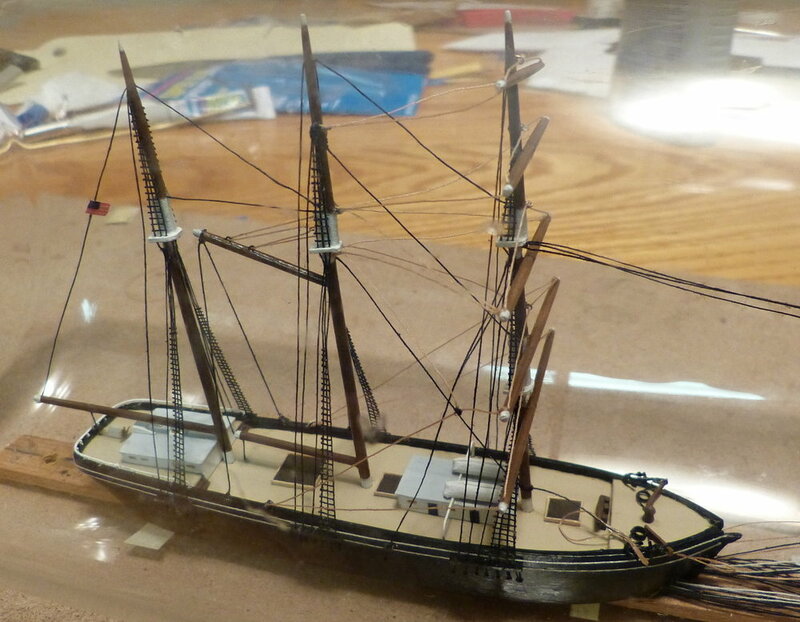 Last photo.... ready for the bowsprit. About the flag, that's the fourth one and I'm still not happy with it. I couldn't get it fully seated on the thread before the glue set. Twice, during a session last week, my thoughts were that I'm not going to build another one again. Contrary to that, having the experience as you mention Mr. S., any future builds should go smoother and with better results. And that is encouragement enough to continue to be creative and enjoy doing something that's rewarding and not everyone attempts. I have some observations in regard to this project and I'm thinking about mentioning them in another thread, for the sake of discussion. That would be coming from someone who has only built one (almost!) SIB. Here's how I put the flag on the line. The first two photos are of the fifth attempt which failed because it wasn't fully seated on the thread as like in the photo in the previous post. (I did trim it after the pic was taken.) Then I figured it out. I didn't account for the thickness of the thread! Yep, thread diameters count. The paper needed to go around the thread and the sharp fold wouldn't allow the thread to seat fully. How much blue tape to hold the flag but to permit releasing? It's a guess. 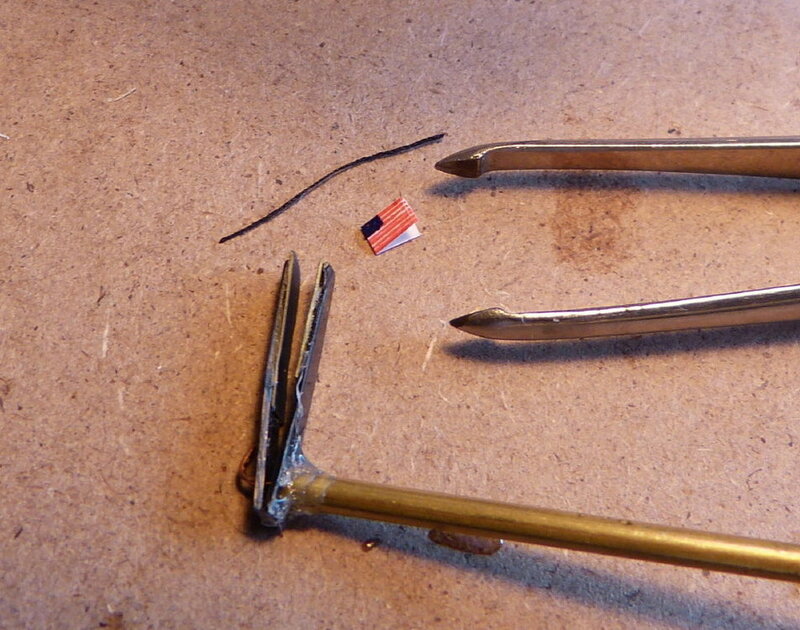 "Flag installation apparatus": with foam to put pressure on the surface of the flag because the thread will hinder the clamping toward the end. This flag has the fold to accommodate the thread thickness. The final result. It's not seated 100% but I'll live with this one. 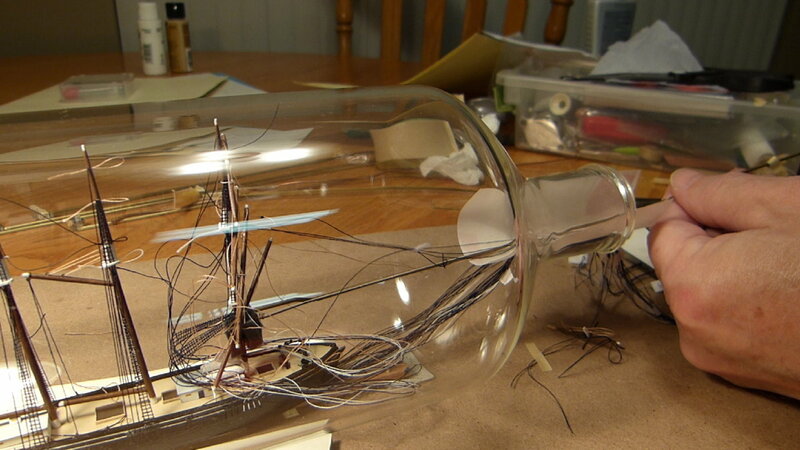 Ships in bottles can be tough but honestly that is the fun of it. You'll see what I mean when you get this one done. There is real satisfaction in having completed something seamingly impossible. There are many different methods as well. 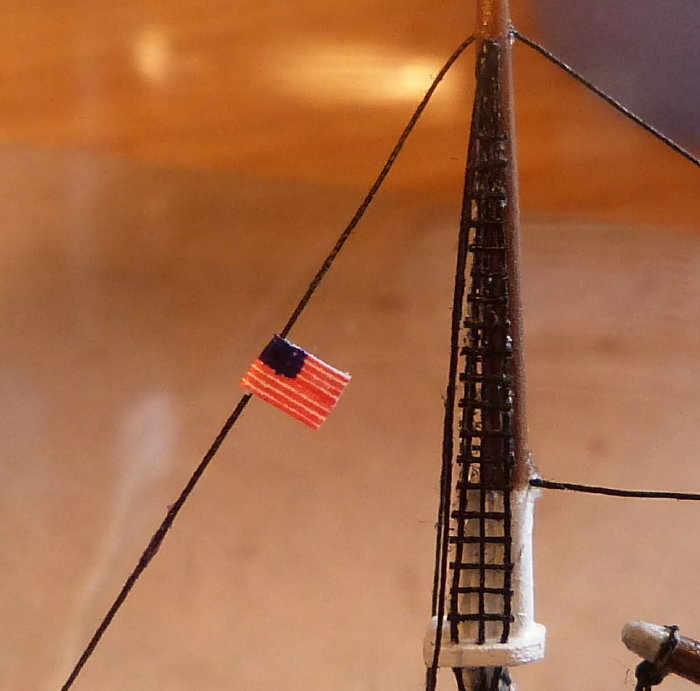 I typically glue the flags on before the ship goes in. 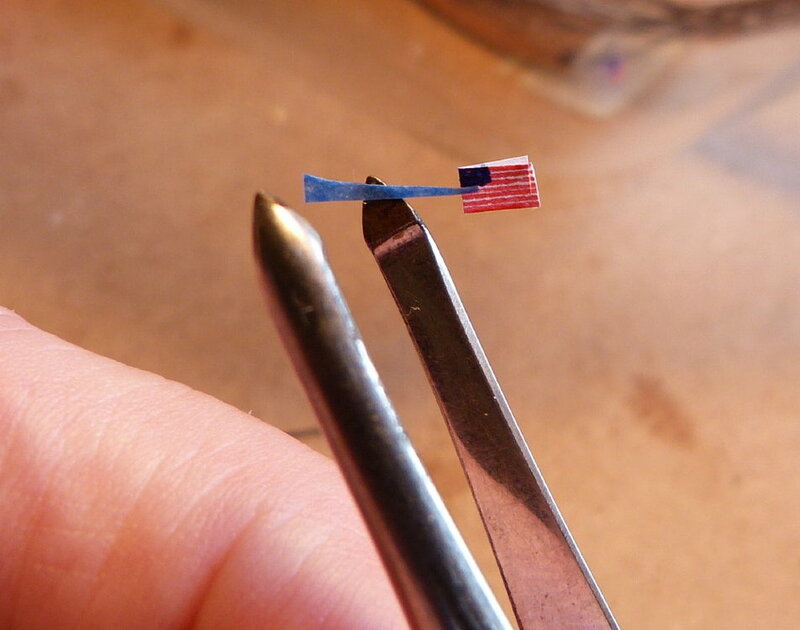 If it needs to slide glue the end of the flag but don't put any glue on the other end with the line. Then the flag will slide up and down on the line as needed. When your ready to set it put a dab of glue on the line in the bottle ans slide the flag over it and into place. The fact that you were able to glue a flag onto a line in the bottle proves you have a great amount of skill in the bottle. 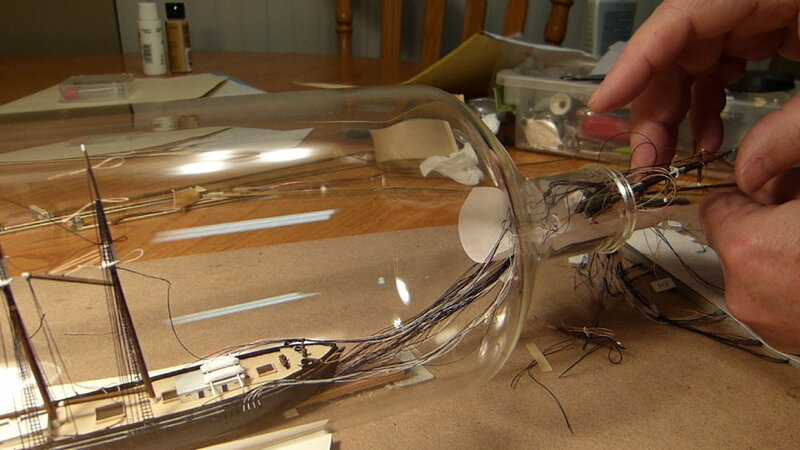 That's ship in bottle repair type skill. I hope you continue because quite honestly your really good at this. Wow, really great work, thank you for sharing! Can I ask what is probably a dumb question? For the shrouds, I see that you run the lines long to help get a little tension in them. Where they connect to the hull at the channels, where do the lines run? Do they run through the hull? And where do they get cut off? 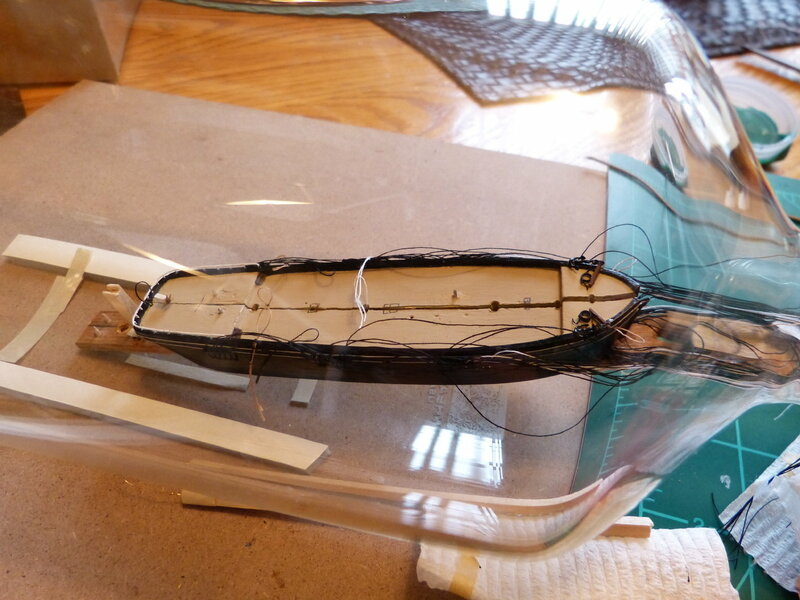 I've always been a little unsure whether lines run through the hull and out the bottom (or the bow), how that works with a split hull, and how that works if you are going to add sea to the bottle. 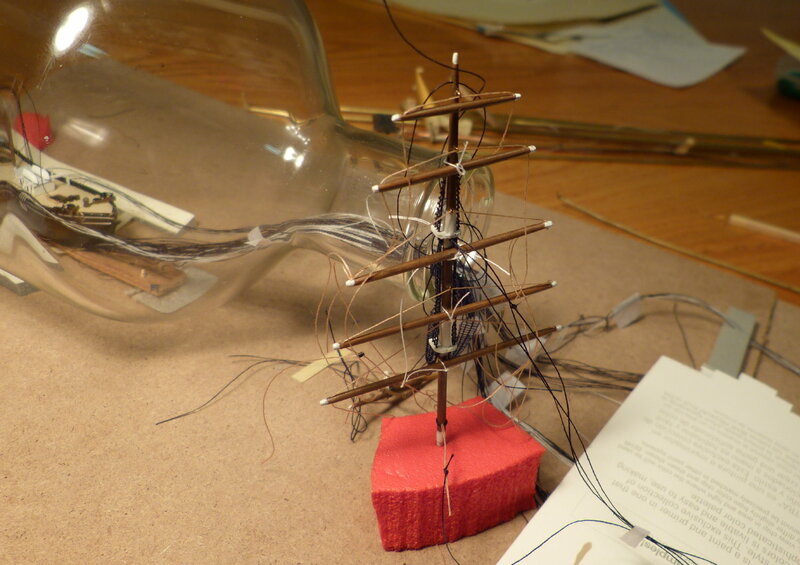 I'm working on a simpler schooner but also would like to install the masts separately rather than use a hinge. 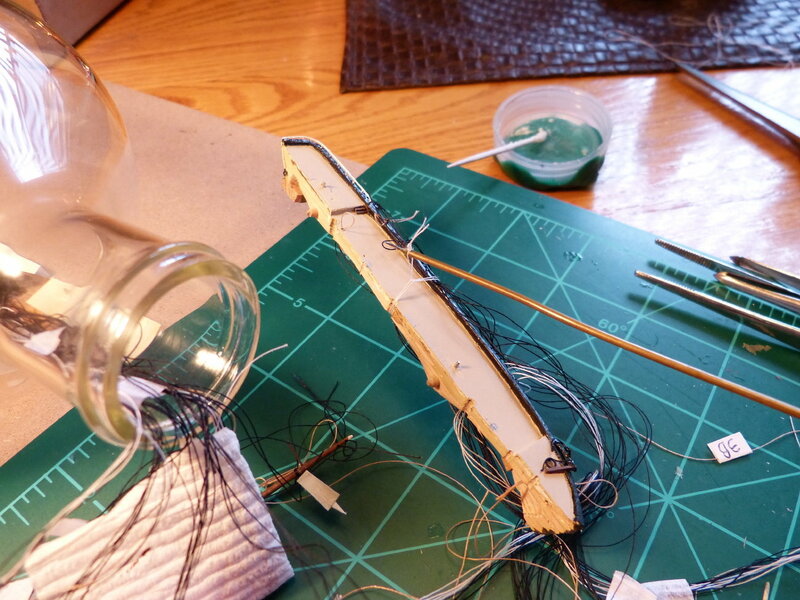 Wanted to prepare the shrouds like you have, but rather than running the lines fixed on top and open at the bottom, because I'm using a standing bottle and inserting from the top, I'm thinking of fixing the shrouds at the channel, then running the line through the masts and gluing/cutting them off there. Seems much simpler, especially if I add sea to the bottle. Thank you for your gracious comments, Mr. S. and Landlubber. Mike, further up on this page there are some photos that show all of the lines that I ran underneath the hollowed out hull. 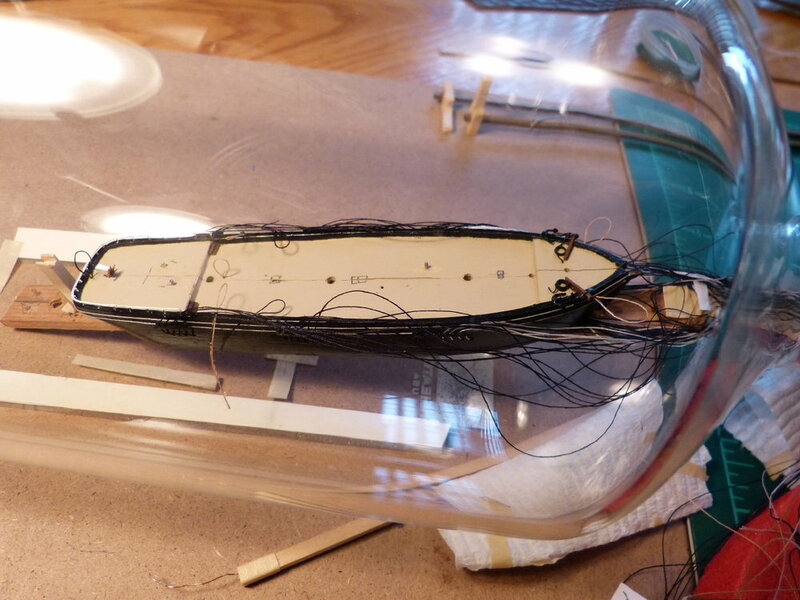 On my project, the shroud lines and back stays are attached to the masts then are threaded through holes in the channels then take an immediate bend to go through holes in the hull. They all then exit at the bow where they will be cut and all of this is below the waterline. This method would work with a split hull or not. Here are my thoughts about your plan for securing the lines at the channels first then trimming them at the mast. Masts can be relatively sturdy or maybe not. How much side force can they take especially unintentional movement? 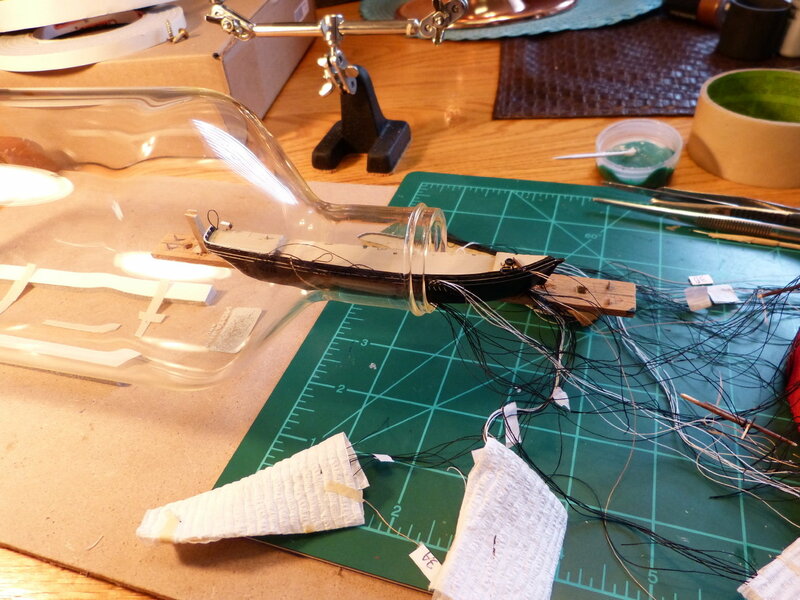 Adhesives can make cutting difficult and especially on a delicate mast. Let us know what you think, Mike.